The Wastemobile travels to many communities to provide hazardous waste disposal services for King County residents and qualifying businesses. It is open Friday through Sunday from 10 a.m. to 5 pm. Here’s what you can bring. For other disposal options, contact the Household Hazards Line at 206-296-4692, toll free at 1-888-869-4233 or haz.waste@kingcounty.gov. Other collection sites for household hazardous waste are the North or South Seattle collection sites, the Factoria Household Hazardous Waste Drop-Off Service or the Auburn Wastemobile. Don’t trash your hazardous waste! Take it to the Wastemobile for free instead. Bring your household hazardous waste to the roving Wastemobile collection event in your area. Check the schedule (listed above) to see when it will be in your area. See what you can bring, what NOT to bring, and transporting hazardous waste and make your drop-off safer for you and the program staff. We do not accept latex paint. Dry it out and dispose of it in the garbage. How to dispose of latex paint. Information is available on what happens to the hazardous waste once it is collected at the traveling Wastemobile or the other collection sites. 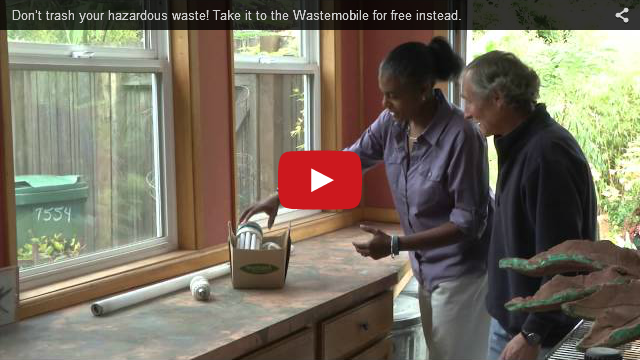 The traveling Wastemobile is funded through a surcharge on solid waste disposal and wastewater discharge. As a result, residents bringing material to the Wastemobile are not charged a fee on site. This cost premium underscores the importance of making waste prevention our top priority. Secure products so they can’t tip over and/or leak. Transport similar, sealed containers upright, in cardboard boxes. Secure the load in a vehicle or trailer. Vehicles arriving at public or private transfer stations in King County with unsecured loads can be charged an unsecured load fee. Stay in the vehicle while waste is unloaded at the Wastemobile and the Auburn Wastemobile.